Celebrate Your Mid-Century Modern Style at DC WISE’s Mad Men Themed Cocktail Party and Silent Auction! Please join us for a night of fun and style, all in the spirit of helping others in our community. There will be drinks, hors d’oeuvres, sweet treats and a silent auction with wonderful items for you to bid on. 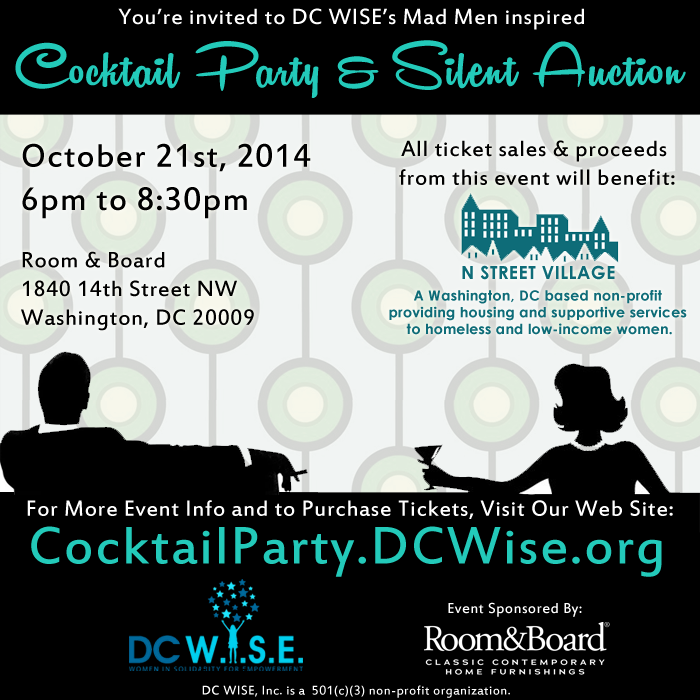 DC WISE, Inc. (DC Women in Solidarity for Empowerment) is a non-profit organization dedicated to helping women and children in Washington, DC. This year, we have committed to supporting N Street Village – an organization providing housing and supportive services to homeless and low-income women in Washington, DC. All ticket sales and proceeds from the event will benefit N Street Village.